Ready to leave the San Juan Islands. 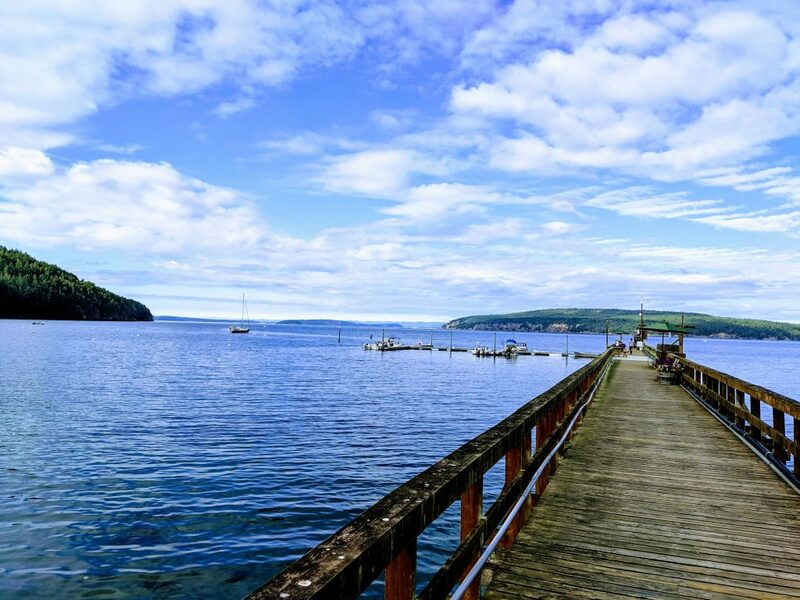 West Beach Resort Pier on Orcas Island. Just a quick update on the last week. 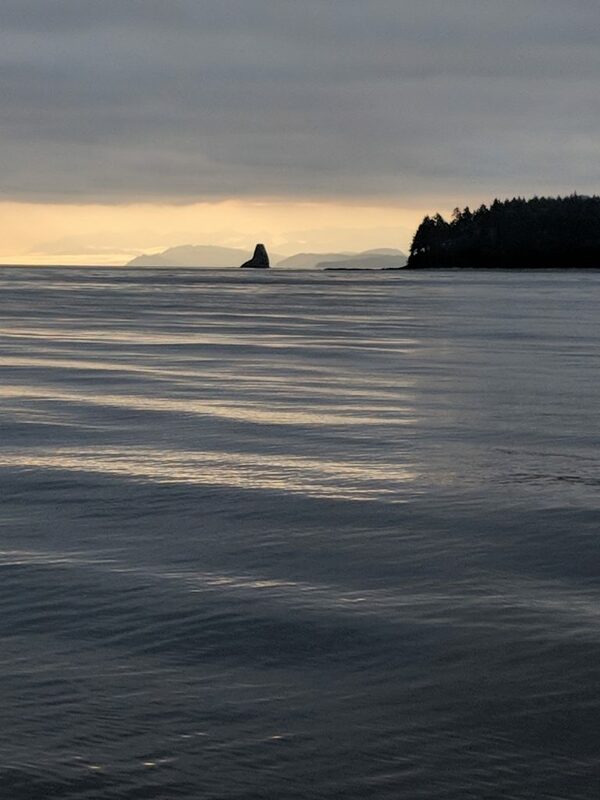 We left Orcas Island in the San Juans and headed for Neah Bay on the tip of the Olympic Peninsula. The ride was pretty easy up to that point. Monday we headed out to make the “Big Left Turn”. We were escorted out by a dozen or so humpback whales feeding on the bait fish in the tide rips. It felt like they where waving us out, although I’m sure they were just busy getting their breakfasts. The tide rips made a pretty rough entrance to the ocean. It felt like we were in a washing machine for the first few hours. After turning South, we had steadily building seas for the next 40 hours or so. The forecast was for 4-5 foot seas from the Northwest and 10-15 knot winds. We had the forecast winds to start with but the winds built to 25+ knots and the seas gradually built to 8 foot primary swells from the North and the Northwest and some 2-3 foot wind waves (chop) thrown in just for fun. It was a bumpy ride. 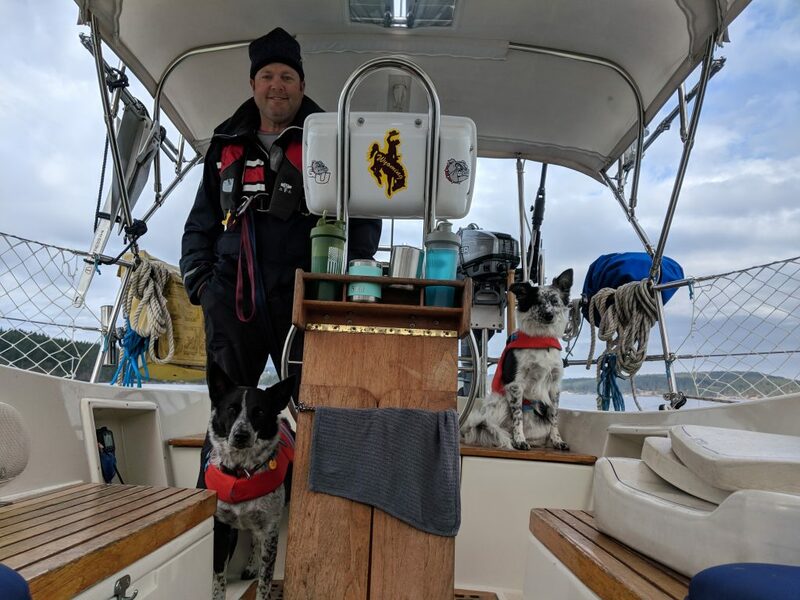 After several attempts to find a sail configuration that would hold up with all of the twisting, we whisker poled out our Genoa and reefed it down to about one third. That seemed to ease the motion slightly and gave us an extra knot of speed. We found out what items on the boat weren’t firmly secured pretty quickly. Everything has it’s point of release. Mac got 2 cups of water square in the face when Sonni set a measuring cup down for one second to open the pot lid…sorry Mac but at least it was the cold water and not the boiling. We did manage to get some good sleep between our 3 hour shifts and LUEGO took great care of us. We never felt scared or in danger, just lots of motion. Okay, one particular roll sent Sonni’s stomach flipping and brought some pretty colorful words from her mouth. Luego would crest a wave, then slide to the left as she began to surf down the other side, the surfing motion creates a rolling of the boat and then a counter roll 1-3 times to get back in place. And repeat, then repeat again, add the next wave direction, and you guessed it…Repeat Again. After hours of this it does seem like your boat takes on a personality. At midnight on the second day I downloaded the latest forecast and for the first time the conditions were forecast to improve. As soon as I finished reading the forecast, the seas began to calm and the winds let up. 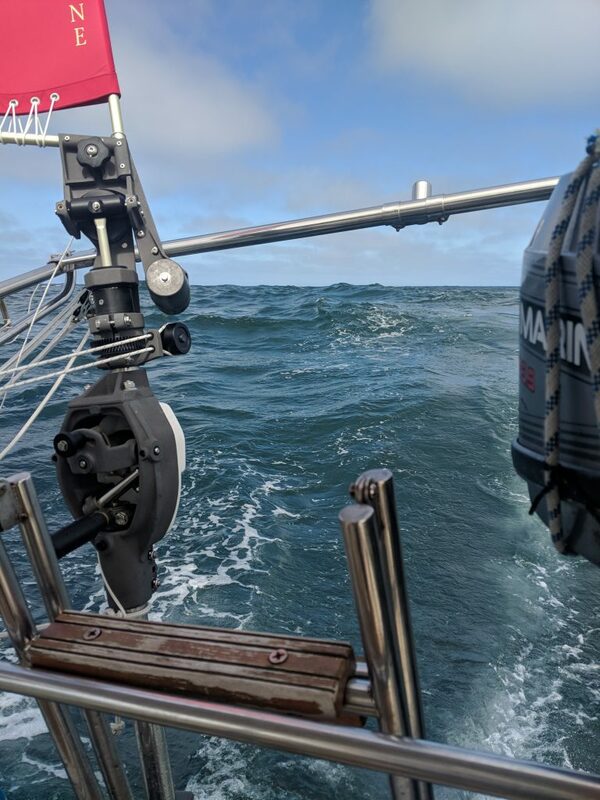 We took down our sail (the wind was too light to keep it open) and motored the rest of the way to Coos Bay, OR. 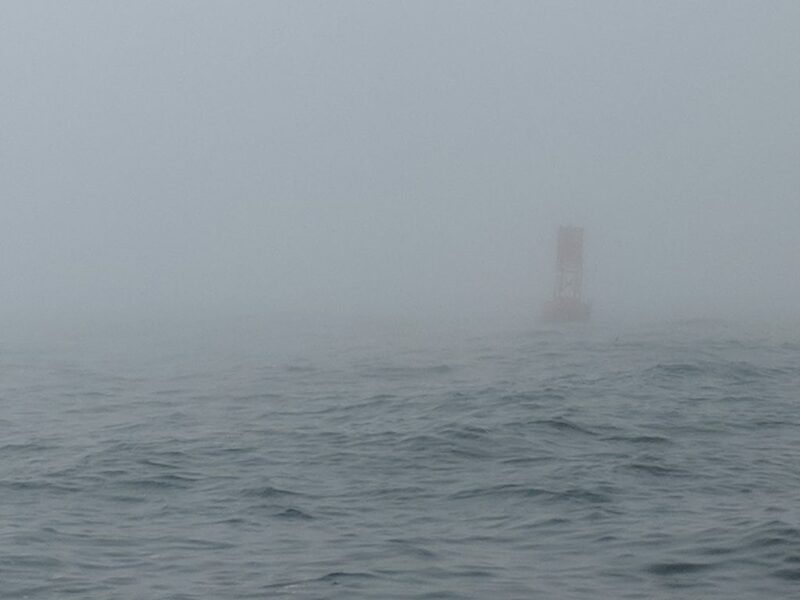 We reached the Coos Bay river bar at about 9:30am yesterday and were met by a bank of fog (the soup style) and a Coast Guard watch boat. 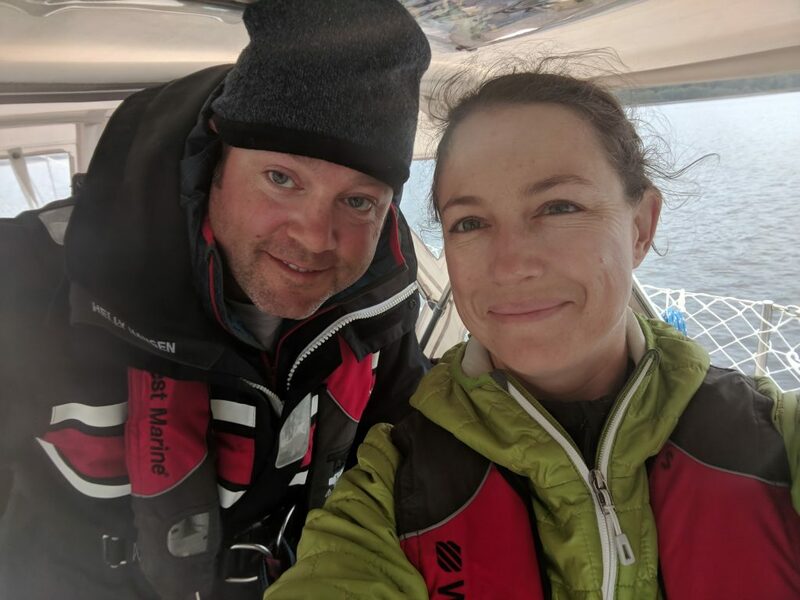 After tying up to the dock and grabbing a bite to eat (the fried and salty kind of course), we immediately took a nap, a shower, a couple beers at the local pub, and went to bed. Entrance to the Coos Bay river bar. Visibility 100 feet. Today we’ll fix some loose bolts on our Hydrovane (self steering) and head off for Crescent City, CA tonight to arrive in the daylight tomorrow. If you haven’t heard of a self steering wind vane, (ours is Hydrovane brand, there are several) it has turned out to be the most valuable piece of equipment we added. It did at least 95 percent of the steering on the way here and allowed us some much needed rest. It is an absolutely brilliant piece of engineering. We’re currently searching for a name for him/her, it’s our third crew member and better at steering than either of us… please send ideas?! Our Hydrovane hard at work! Wow!! Glad to hear you are officially on your way and safe. I know about the swells etc but not on a sail like yours. Enjoy and please be careful and wise. Thinking about you. Good Morning Pam, It’s a beautiful morning in Crescent City, CA. We’re going to take a few days rest and let the dogs run on the beach. “steady Eddy” – keeping you on track. Good to hear you are in California. Enjoy! Horace. Love the pics and updates. Is SF next stop after Cresent City? Awesome pics! Wow you’re already 2/3 the way to San Fran. I’m sooo excited for you!!!! I vote for “Natalie”. A small token of thanks for letting you copy my homework. JK, love the blog and safe sailing! Hi Michele, Horace is a great name! Yes, we’re headed for SF tomorrow. If the weather holds we’ll make it sometime Friday. If not, we’ll duck in to Fort Bragg. I like Eddy! My middle name! Ha! You have a very valid point! That deserves some very thorough consideration! You could call her NS (pronounced En-nis) for North Star….don’t all sailors who followed the stars use it? Wow, your stories are fabulous, well written, and very entertaining….knowing you will be careful….keeping you in our thoughts and prayers. What a glorious adventure! What an exciting time for you both. Nothing better than living your dreams. I know you’ve done a lot of work to get to this point. Very proud of you both. Stay safe and enjoy every minute of it! Thanks Don! Great to hear from you! Hi Gail, Great to hear from you! That’s a great name. Oddly, I’ve been staring at the North Star staring out the back of the boat to tell if we’re still on course (it’s too cold to stand at the helm all night). Thanks for the nice words. We’ll try to keep it up! Heading for a WWII museum in a bit. We’ll send pictures. And yes, the barf count is still at zero on our boat. Our friends haven’t been so lucky. Thanks Scopalomine patches!